– A teen boy and a teen girl kiss passionately, they go in a shower (they’re clothed) and continue kissing, remove their shirts (we see bare shoulders and her bra straps), he presses her against the wall and thrusts and moans and she breathes heavily. ► A teen boy and a teen girl talk and she plays with his hair; they kiss and lie back on the grass. A husband and his wife kiss at their wedding. A husband and his wife sleep in bed clothed. ► A young man is shown wearing only boxer shorts and we see his bare chest, abdomen and legs. A teen boy is shown wearing only underwear and we see his bare chest, abdomen and legs. - A teen boy does CPR and mouth to mouth resuscitation on a teen girl in the front seat of a car after she takes drugs (she is revived). ► A man drives through streets in the rain looking for his son and finds him cowering in a dark alley; he's soaked to the skin and he vomits on the man when he gets in the car (we see vomit spray). A man drives through an area where it seems that people are drug users and sellers. ► A teen boy breaks the door of his father's house open and falls on the floor; he and a teen girl take things from the house (presumably to sell for drugs). A teen boy speeds away from his house and is chased by his step-mother along winding roads (she eventually stops and he is gone). ► A man and a woman argue bitterly over the phone about how they are dealing with their son's drug addiction and frequent disappearances. A teenage boy snaps at his father when he tries to wake him after a late night out. A teen boy yells at his father that he can't make him go to rehab since he is 18. A father and his son argue bitterly in several scenes. Two children fight and cry after some money that belongs to one of them disappears. A teen boy asks his father for money and the man refuses; they argue and the boy leaves. A man tells his teen son that he can't help him and that he can't come home. A man says to his ex-wife, "He's gonna die even if we do help him." A woman tells a man that his son needs treatment and that there are "still so many drugs in his system." 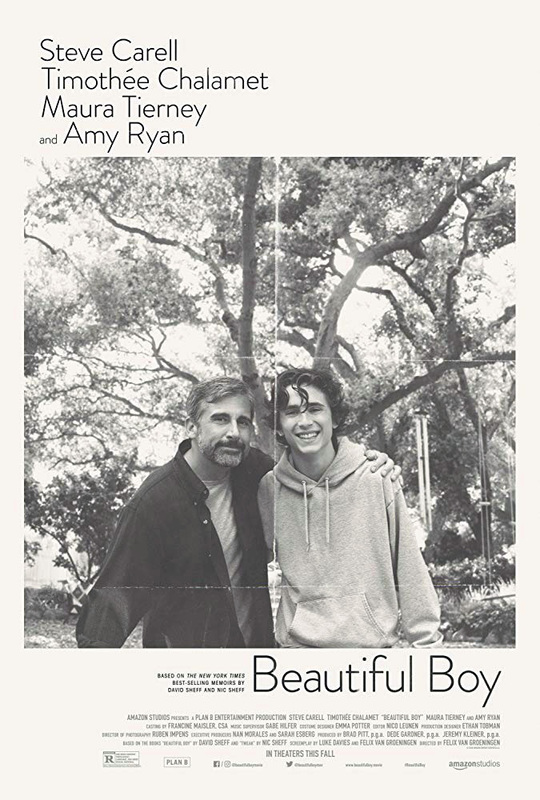 A young boy travels on a plane alone and he is mad at his father for making him go; they reconcile. A man takes a young woman for a meal (she seems to be a drug user) and they argue causing her to leave. A teen boy yells and throws things around his room. A man calls a hospital trying to determine if his son has been admitted (he hadn't come home for two days). A man is shown in several scenes talking to medical personal and researching the effects of addiction to crystal meth and how it changes the brain causing breaking the addiction to be nearly impossible. A man describes addiction to crystal meth and that it physically changes the brain and causes nerve damage. A man quizzes his son about why he spends so much time in his room. A man receives a call from a hospital that his son has been admitted and when the man arrives at the hospital the boy has checked himself out. A woman calls a man and reports that his son has left a rehab facility and apparently relapsed. A man asks his son about his drug use and the boy tells him that they make him feel better than he has ever felt. A father and son argue after the man asks if the boy has stolen money and whether he is using; the boy storms out saying, "You're suffocating me." A teen boy's journal shows dark drawing and language about his drug use and desperation to continue using. A man talks about rehab success rate being in the single digit percentage. A man asks his teen son to take a drug test after having been out late. We hear that a woman's daughter died of an overdose. ► A teen boy drives while smoking a marijuana cigarette. After a teen boy injects himself with a drug we see him under the influence, stumbling around and looking dazed, sometimes laughing. We see a teen boy's arm covered with scabbed injection marks. A father and his pre-teen son go surfing and the man loses sight of the boy in the surf, and then spots him speeding along the waves and he is OK.
► A man pulls a car over and a teen boy gets out and vomits at the side of the road (we hear gagging but do not see vomit). We see that a car has been in an accident; the headlight is broken and the side is scratched. - Several scenes show a young man preparing a drug and injecting himself and one scene shows him injecting a young woman as well, a man and his son share a marijuana cigarette, a man snorts cocaine off his desk, a woman tells a man that his son needs treatment and that there are "still so many drugs in his system," a man and his son talk about the drugs that the father had done in the past, a teen boy talks about having been using drugs for two years and that he has tried a lot of different drugs, a teen boy prepares a drug in a public restroom and injects himself (he twitches and lies on the floor), a teen boy drives while smoking a marijuana cigarette, and a teen boy takes a prescription medication from someone else's medicine cabinet (we don't know what it is). People drink champagne at a wedding reception, a young man and a young woman drink from beer cans. A young man smokes a cigarette. - Parenting, families, dealing with crises, drug addiction, crystal meth, divorce, mistakes, forgiveness, alienation, isolation, relapse, reality, anxiety and fear, feeling like something is missing, chasing a perfect high. - Drug addiction is a nightmare for all involved and addiction to crystal meth is particularly horrific.